This is the cooking and eating class you’ve been waiting for! 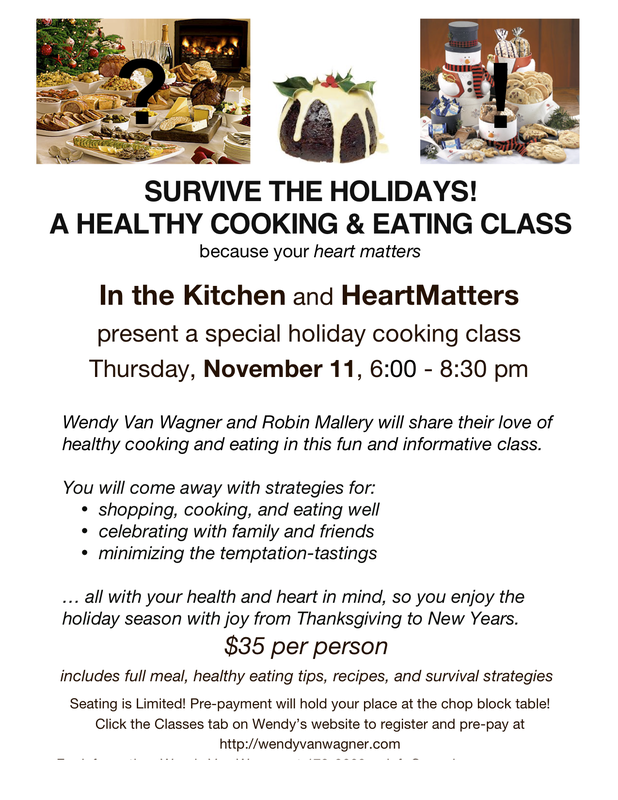 Back by popular demand, I am partnering with Wendy Van Wagner of In the Kitchen to present this special class–just in time for the holidays. Do the holidays seem like a food-free-for-all? Around the family table at Thanksgiving, do you have to loosen your belt in between dinner and dessert? Do you stumble to the couch for a post-meal nap? Are you tempted by the endless supply of “goodies” that magically show up on December 1st–homemade cookies, fudge, caramel popcorn balls, veggies and rich dips, sweet and fruity punch (that you wouldn’t drink any other time of year), parties, parties, and more eating parties…? The Holiday Survival Cooking and Eating Class will support your intention to maintain a nourishing balance in your life over the holidays. We’ll talk strategies for making sane–and still satisfying–choices at parties and family gatherings; how to shop for and cook healthy dishes for your own table and to take to parties; and how to bring a sense of balance by incorporating physical activity, positive affirmation, and the practice of quieting your mind. All of this while we eat, drink, and be merry around the chop block table! Join in the fun on Thursday, November 11 at 6:00 PM, come away divinely satiated, and with confidence that you can Survive the Holidays! Space is limited, click here to register, scroll down to November 11th… See you there. The Holiday Survival Cooking and Eating Class exceeded my expectations. It was so enjoyable to learn new ideas for healthy snacks and meals, taste the delicious treats we created and leave with an inspired hope that this will be my healthiest holiday season yet! I am impressed with the knowledge and care that Robin (and Wendy from In the Kitchen) both possess and I look forward to taking more classes in the future. Thanks again! What a wonderful, yummy class! Not only did we participate in creating several easy-to-make, delicious, nourishing dishes for the holidays and every day, we also learned strategies for surviving and enjoying the upcoming holiday season. Both Robin & Wendy were delightful and imparted their cooking and eating knowledge with love, humor, and enthusiasm. I highly recommend their classes to anyone who is interested in developing a better way to look at food, using thoughtfulness with mindfulness to learn some very valuable strategies for eating any time of the year! Thank you Rose! It is so thrilling to receive happy feedback from class participants. I love sharing my passion for eating real food in a way that is not only delicious but one that supports your optimal health. I especially am touched by your optimism for enjoying the holidays with food mindfulness, and gratified to be a part of that for you. I’ll look for you in an upcoming class! Yummy is right, Cathy! I’m so pleased that you came away gastronomically grateful and perhaps more importantly, feeling confident about enjoying the upcoming holiday season with intention. Thank you for the kind words! I found the class delightful with great ideas for the holidays. The Kitchen is a warm and welcoming place and you and Wendy were great teaching collaborators. Good new recipes. I appreciate your healthy eating information. I recommend this class to anyone wanting to enjoy the holidays without stressing over food. Actually, the information isn’t just for the holidays. I want to stay healthy all year and eat well. From knowing you Pat, I can surely say that you show the radiance of one who wants to stay healthy all year and eat well! Wendy and I had fun co-teaching the class–each of us appreciates the opportunity to share our passion(s) with the world: cooking with ease, and eating local, healthful, real food. Thank you for being part of the class. 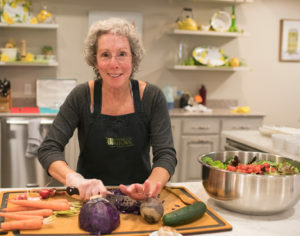 I’ve participated in several classes at In the Kitchen, enjoyed them all immensely, but it is always a special treat when Wendy teaches a class. The recipes offered in The Holiday Survival class were easy to make and so delicious. And what a plus to have Robin co-teach the The Holiday Survival class with Wendy. Thank you, Robin, for all your great information on healthy eating, which was delivered so professionally, dovetailing beautifully into Wendy’s presentation. Hope you two team up again for more classes of scrumptious, healthy recipes. What a fun evening!! Thank you Carol! Wendy and I definitely have a chemistry–her delightful and easy-going personality as well as her love of local food and flare for making cooking look so easy, and my passion for sharing the healthful considerations for eating real and local food as well as making it convenient and pleasant to be in the kitchen, are a powerful combination! How wonderful that you joined in our fun and informative class, and yes, stay tuned–there will be more to come! Happy Holidays!